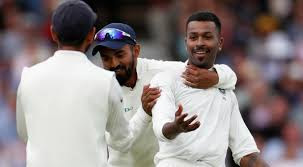 Indian bowlers did a great job in this Ind vs Eng 3rd test Day 2, especially Hardik Pandya who got 5 wickets in his short spell of 6 overs and stopped England at 161/10. While India scored 329/10 in his 1st inning in which Virat Kohli 97, and Ajinkya Rahane 81 played the best inning for India. Anderson, Woakes, and Broad got the 3-3 wickets in India's first inning. Virat Kohli(c), Rishabh Panth(w), Ajinkya Rahane, Shikhar Dhawan/Murli Vijay/K L Rahul, Cheteswar Pujara, Hardik Pandya, R Aswin, Mohammad Sami, Ishant Sharma, and Jasprit Bumrah. Hi Friends, I am Gyan Ranjan and you are on this blog post to know live cricket score of Ind vs Eng 3rd test Day two match. I promise to give you the best experience in this blog post. Today India started the inning from 307/6 but could add only 22 runs with the previous total 307 and all out at the total score of 329/10. So in today's first session, India added 22 runs for the loss of 4 wickets. England started their inning like one day match with fast scoring but due to best bowling performance of Indian bowlers all-out at the score of 161 only. Hardik Pandya did amazing bowling and got 5 wickets in his short spell of 6 overs. Jasprit Bumrah and Ishant Sharma got the 2-2 wickets. Sami could get only one wicket. R Aswin also did great bowling but couldn't get any wicket. Jos Buttler 39, Jennings 29, Cook 20, Root 16, Bairstow 15, Pope and Stocks scored the 10-10 runs. So in this way, India got lead of 168 on the basis of the first inning scores of both the teams. India started his 2nd inning with as usual Shikhar Dhawan and KL Rahul. Shikhar Dhawan scored 44 bold by Adil Rashid and Stocks got the wicket of KL Rahul who scored 36 runs. India scored 124/2 at the end of Day 2 match. Virat Kohli and Pujara still on the crease. India got the lead of 292 runs.